Radian Solutions shall provide Technology Recovery Planning (TRP) Services to the Department of Housing and Community Development (HCD). Under this contract, Radian shall provide risk management, disaster recovery, and business continuity services for the HCD. UST Global (Prime) and Radian Solutions (Subcontractor) team won the Fi$Cal Readiness project providing legacy migration services for the Department of General Services. Under UST Global’s oversight, Radian will provide Microsoft and Oracle Systems expertise to gather requirements, document designs, as well as re-engineer, update, modify, and test various DGS legacy systems that will interface with, or be converted to, the Financial Information System for California (FI$Cal). Radian Solutions was chosen to provide support on the DHCS Children’s Medical Services (CMS) project for the third year in a row. On this contract, Radian shall provide Application Technical Support and Maintenance Services. The primary program served by CMS Net is California Children’s Services (CCS) which is a federally mandated public health program operated jointly by the State and counties. CMS Net also serves the Genetically Handicapped Persons Program (GHPP) which covers Californians who have genetic diseases such as cystic fibrosis, hemophilia, sickle cell disease, and specific metabolic diseases. Inc. magazine today ranked Radian Solutions LLC #1622 on its 34th annual Inc. 5000, an exclusive ranking of the nation’s fastest-growing private companies. Radian Solutions achieved a revenue growth of 251% between 2011 and 2014. We are extremely proud of this accomplishment. We would like to take this opportunity to thank the Radian team, without whom we would have never achieved this milestone and to our clients who trusted us with their mission critical projects. Radian Solutions was chosen to provide support on the DHCS Children’s Medical Services (CMS) project for the second year in a row. On this contract, Radian shall provide Application Technical Support and Maintenance Services. Radian Solutions was chosen to provide COGNOS Business Intelligence Reporting support on my|CalPERS Project. Radian Solutions provided analytical support to develop, maintain and execute the Data Reporting Service Request process leveraging CalPERS service request/fulfillment tool, and support the administration of the Cognos Reporting tool for ad-hoc and service-metric report authors within the business areas. Radian Solutions was chosen to provide IT Release Management support on my|CalPERS Project. Using the my|CalPERS Change and Release processes, Radian Solutions provided Change and Release Management services and was responsible for facilitating the determination of a release’s scope, managing the scope through the Design, Build, Test, Implementation and Review phases of a release. Radian Solutions was chosen to provide PeopleSoft support for the California Department of Technology. Radian Solutions shall support Peoplesoft Financial, Human Resources, and Enterprise Learning ERP applications. Radian shall provide PeopleSoft upgrades, create customizations, reports, and interfaces on this project. Radian Solutions wins the Office of Systems Integration’s (OSI) EBT-SARS Support Services Project. Radian Solutions provided technical and financial reconciliation services to develop, maintain, and support the Statewide Automated Reconciliation System (SARS) for the California Electronic Benefit Transfer (EBT) Project. Radian Solutions was chosen to provide support on the DHCS Children’s Medical Services (CMS) project. On this contract, Radian shall provide Application Technical Support and Maintenance Services. 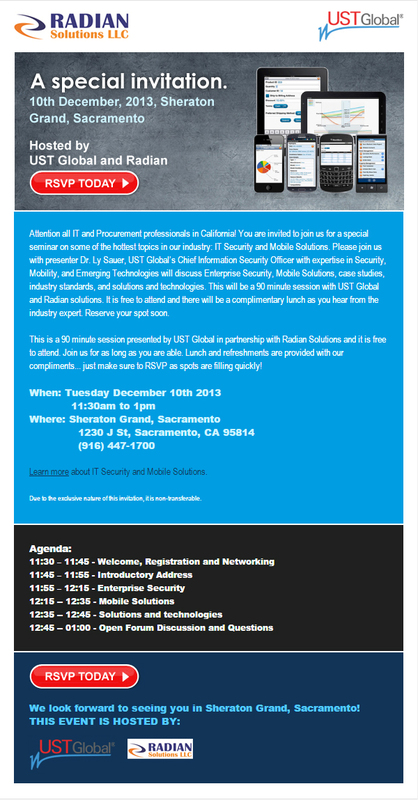 Dr. Ly Sauer, Chief Information Security Officer, UST Global presented at the Lunch & Learn session in Sacramento on Dec 10th, 2013. The event was moderated by Mr. Niranjan Hiras, President, Radian Solutions. Dr. Sauer cited various examples of new & sophisticated attacks on government domains, contributing factors and the importance of securing IT assets from such attacks. Dr. Sauer educated the audience on IT Security Lifecycle, Security Architecture framework, and the infosec triangle (Confidentiality, Availability and Integrity). Finally, Dr. Sauer discussed UST Global’s security solutions, their approach and benefits. Dr. Sauer engaged the audience, encouraging them to ask questions and discuss issues they were facing in their own departments. The attendees were impressed by Dr. Sauer’s credentials and the experience she brings especially from her federal and defense projects. Dr. Sauer discussed the transformation mobility brings to an organization, the elements of mobile ecosystem, and how mobility further complicates IT security. Dr. Sauer also presented UST Global’s strategy in providing mobile solutions for an organization with all-inclusive solutions instead of a piecemeal approach. RADIAN SOLUTIONS SPONSORS, TECHWIRE FORUM WITH CDCR AGENCY CIO JOE PANORA AND EXECUTIVE TEAM. RADIAN SOLUTIONS SPONSORS, TECHWIRE FORUM WITH DEPARTEMENT OF JUSTICE CIO ADRIAN FARLEY. RADIAN SOLUTIONS HAS ADDED NEW CATEGORIES ON CMAS. Radian Solutions is now approved for additional categories on CMAS. The new categories include, Acquisition Support, Process Re-engineering, Project Planning, Project Management, Requirement Analysis, Risk Management, and Strategic Planning. RADIAN SOLUTIONS CHOSEN TO IMPLEMENT DATABASE DEVELOPMENT & AGILE PROJECT MANAGEMENT SERVICES FOR CALIFORNIA STUDENT AID COMMISSION. Radian Solutions was chosen to provide Database development and support services and Agile Project Management Services for the California Student Aid Commission. At Radian Solutions, we are excited about providing these services on pivotal project that will impact the Student Aid processes resulting in improved services to Educational Institutions throughout California. RADIAN SOLUTIONS APPROVED FOR US SMALL BUSINESS ADMINISTRATION’S 8(A) BUSINESS DEVELOPMENT PROGRAM. The US Small Business Administration approved Radian Solutions to participate in the 8(a) Business Development program. The 8(a) program enables Radian to access Set-Aside contracts with the federal government and private companies. Radian is thrilled to be part of this 8(a) business development program and offer its expertise to the Federal government clients. RADIAN SOLUTIONS CHOSEN TO PROVIDE BUSINESS ARCHITECTURE SERVICES FOR THE HEALTH BENEFITS EXCHANGE (HBEX). Radian Solutions was chosen to provide Business Architecture services on the Department of Health Care Services. Radian will provide Business Architecture on the new effort of implementing the Affordable Care Act (ACA) in the State of California and shall provide its services in assisting in development of the Health Insurance Exchange for the State of California. RADIAN SOLUTIONS CHOSEN TO PROVIDE ENTERPRISE ARCHITECTURE SERVICES ON FI$CAL PROJECT, STATE OF CA. Radian Solutions emerged winner in a competitive bidding process to provide Enterprise Architecture Services on the ERP implementation of Financial Information System for California (Fi$Cal Project) with the Department of Finance. We are very excited to provide the EA services on this high value, high visibility project that impacts various departments financial systems & processes within the State of California. Radian is now an approved vendor eligible to provide IT Services to the California Public Employees Retirement System. We are excited to have an opportunity to serve one of the largest public retirement organizations in the nation. Radian is now an approved vendor on the State of North Carolina for Short Term IT Services. We are excited to have an opportunity to serve the Short Term IT Services needs for the State of North Carolina. Radian is now an approved vendor on the State of Wyoming for Temporary IT Services. We are excited to have an opportunity to serve the IT Services needs for the State of Wyoming. Radian is now an approved vendor on California IT Master Services Agreement (IT-MSA). Approval on this contract vehicle graduates Radian to the elite group of only 120 companies. In a competitive bid, Radian emerged winner to provide SAP Production Support IT Services for the California Department of Corrections and Rehabilitations (CDCR), State of California. State of Minneapolis approves Radian as an IT consulting vendor for their Statewide Master Contracts program to provide Staff Augmentation and IT consulting requirements. State of Michigan approves Radian as an IT consulting vendor for their Staff Augmentation and IT consulting requirements. State of South Carolina has approved Radian as a qualified vendor for IT Staff Augmentation Services. This contract enables Radian to fulfill the State of South Carolina’s IT Staff Augmentation needs through August 2014. State of Florida has approved Radian as a qualified vendor for IT Consulting Services. This contract enables Radian to fulfill the State of Florida’s needs in the areas of Analysis and Design, Development & Integration, Operational Support and Staff Augmentation. This contract is valid through Aug 2012. Radian is awarded IT consulting contract with the State of Washington. This contract is valid from September 2009 through June 2010 with possible 1-year extensions for additional three (3) years. Radian is awarded IT Consulting Services contract with the State of Mississippi. Upon reviewing Radian’s capabilities the State of Mississippi awarded Radian the contract to provide IT consultants for State’s requirements. This contract is valid through January 2010. Radian Solutions wins contract with the State of California to maintain and enhance database (MS SQL Server and MS Access) applications. In a competitive bidding process, Radian is awarded a contract through June 2011. In a competitive bidding, Radian emerges a winner with the State of California. Radian will implement Legal Software solution – Time Matters 9.0 for the State that will result in streamlined work processes and single integrated tool for the legal staff. Radian Solutions enters into strategic alliance with SOURCiS.com to build on each other’s strengths. SOURCiS offers web Solutions to its retail clients. The State of California awards the software maintenance contract to Radian Solutions. In a competitive bidding, Radian emerges a winner for this contract – to maintain and enhance database application for the State of California. Radian received the CMAS Certification from the State of California. This certification qualifies Radian to do business with the State, County, City and Universities in the State of California. Additionally, Radian is also certified as a California Small Business which entitles Radian a 5% bidding preference.